I got my SWTPC (Southwest Technical Products) 6800 in the spring of 1977 while a freshman at the University of Maryland. I had ordered it in December of 1976 in Rockville, Maryland. The store I had purchased it from was so backlogged from orders that it took three months to have the system built. In those days most all home computer systems were in kit form. Initially, I had traveled to Springfield, Virginia to purchase an Altair 8800, having seen an add in the Peoples Computer Company periodical a year earlier while being in high school in Frankfurt, Germany. The Altair seemed cool enough, but would it work with a Teletype machine? We gave it a shot. After three attempts and each time getting a checksum error while trying to load BASIC we gave up. (Trivia question: Who wrote the Altair BASIC?). I was hooked! I bought the 6800. It was a decision I have never regretted. The ASR-33 has long been retired, but the 6800 is still in use to this day. Obsolete indeed?! The SWTPC 6800 was the first and most famous of a line of computers based upon the SS-50 bus. The SS-50 bus is 50 pin (obviously) bus that is very "hacker-friendly"; the pins being made by a sequence of male Molex connectors. This design contrasts sharply from the traditional "golden fingernail" style that is virtually on all other bus types. Other companies, such as Smoke Signal Broadcasting (SSB), Midsouth, Helix and Gimix built computers based upon the SS-50 bus and the Motorola 6800 microprocessor, rather than the S-100 bus and the Intel 8080 microprocessor which was used by the Altair 8800 and many other computers of the day. 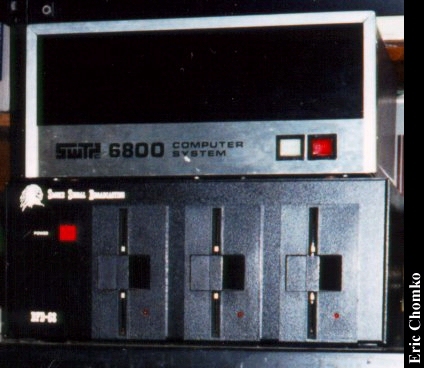 The SS-50 line did not stop with the 6800. Additionally, systems based upon the Motorola 6809 and 68008 (8 bit version of the 68000) have been created. And the SS-50 bus was expanded to 64 pins, which is for all practical purposes the limit. True 16 bit computing and megabyte addressing retired the SS-64 (50) bus. 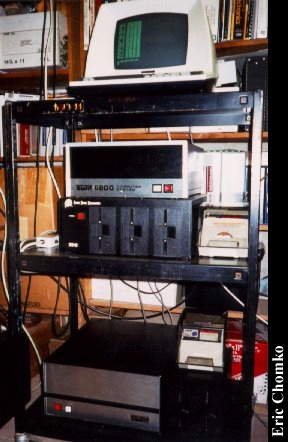 The two systems pictured are my original SWTPC 6800 (top) and a SWTPC 6809. Both systems use the SSB disk system. And the terminal at the top is a Televideo 910. Both systems can communicate with either the terminal or my PC. Click here to view all comments for the Southwest Technical Products 6800 and to leave your own. Click here to view comments about other Southwest Technical Products computers.